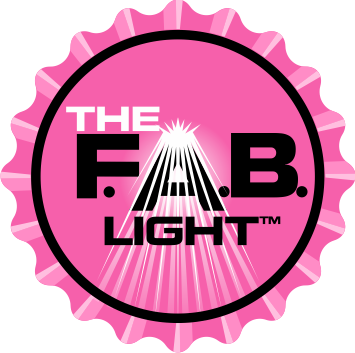 The many uses of The FAB Light™! Find A Brand! Get Your Company Noticed! I am excited to share this week's Spotlight Mom and product review (on Friday) with you, as I am just loving the F.A.B. Light, created by Linda Pond. Linda's invention is just another fine example of creating a product out of necessity. The F.A.B. Light is a remarkable and unique promotional product. Peel and stick it to the inside lid of coolers (Find A Beer) tool boxes (Find A Bolt) tackle boxes (Find A Bobber). F.A.B. Light: Find A Brand! It is a single LED (Light Emitting Diode) encased in acrylic. The material causes a 'light pipe' effect as the light cascades through the clear acrylic, lighting your enclosed container while it lights up your company's logo or message. Patented in both the U.S. and Canada, this invention was based on a single question: "How come there is a light in a fridge, but not in a cooler?" Now, the FAB Light™can be placed on the inside lid of any hinged box that may require light: Tool Box, Jewelery Box, Toy Box, Chest Freezer, Fishing Tackle Box. It can even be worn on the wrist as a hands-free lighting device, requiring only the bending of the elbow to turn the light on and off." Favorite Book: "Gone With the Wind"
My husband and I have been married for 38 years. We have one daughter, Rhonda, who is 38 and has 2 children, 12 and 9. Which makes me the best – and most fun –‘Nanny’ around! Married young, Rhonda and I kind of grew up together. We still enjoy playing sports together, especially ladies fastball – she is our catcher and I am the pitcher – and have been on the same team for 24 years – and counting. Our team camaraderie means we also share the same friends both on and off the field. We can’t wait til Paislee, my granddaughter, turns 14, so she can be a FABulass too. 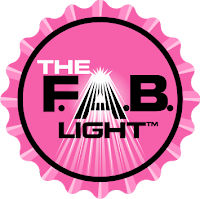 The FABulasses are sponsored by our invention, The F.A.B. Light. One hot night in August, as our ladies fastball team was celebrating a victory around the team cooler, Rhonda reached into the cooler for a beverage, and said these now famous words – “how come a fridge has a light, but there is no light in a cooler?” After a quick Google search, we discovered there was nothing like it on the market. My company, Customer Connects Inc, had already created an outstanding network in high tech Ottawa, so I went to them for help in developing our invention and bringing it to market. From identifying the NEED, to prototyping, to patent approval (Rhonda and I are patent owners), to product design, to finding a distributor, to hiring a manufacturer, to marketing and sales, we were successful in taking our product to market. It is sold around the world via distributor Coghlans Ltd, and can be purchased in the camping aisle as ‘The Cooler Light’ in most large retail stores. The F.A.B. Light is attached (peel and stick) to the inside lid of any hinged enclosure. Open the lid, the light comes on. Close the lid, the light goes off. Automatically. F.A.B. stands for Find A Beer (cooler), Find A Bobber (tackle box), Find A Bling (sewing box), Find A Bandana (motorcycle/horse saddle bag), Find A Bolt (tool box), Find A Burger (freezer), and our favourite F.A.B. – Find A Bowl (toilet seat). Breaking into a new market, we now can customize our invention with corporate logos and photographs, which is sold as a promotional product called ‘The F.A.B. Light’ – Find A Brand. Networking is the best way to get noticed and create new business, so I usually attend 3-4 networking events per week. Since my office is in my home, these outings are important to my business as well as my state of mind. Following up after networking, research, answering emails, blogging, writing articles about the F.A.B. Light, web site updates, are all accomplished from my home office. My husband and I have the distinct pleasure of having our daughter and grandchildren live with us part time, so our blended families bring a closeness not found in many other family relationships. My granddaughter is growing into an innovative inventor herself, and this is very exciting to watch and coach her along. When inventing a product, the biggest question is ‘What am I supposed to do now? ?’ The next question is ‘how am I supposed to pay for all this?’ I was very fortunate in that my network of high tech companies were ready and willing to help. We structured a royalty agreement, which meant I didn’t have to come up with the cash (a stopper for most) at the beginning, and rewarded the designers with compensation once the product started to sell. I married young, and my daughter and I followed my military husband around the globe for the first 25 years of our marriage. Rooting a career was difficult, so I continued to attend school at each posting. By the time we settled, it was my turn. I enjoyed a career of Medical Laboratory Technology for 12 years before I made the move into high tech. Laid off in 2002, I started my own company called Customer Connects Inc, where I connected the high tech community to new opportunities. It was this network that enabled my own opportunity – who embraced me and our invention going to market. Running (and losing) in the municipal election in 2010. Losing is a major success? You bet. Look at the value received in getting noticed. Staying positive, and not giving up when challenged with major obstacles – and there were many. I am motivated by the fact that since my daughter is a co-inventor, my success is her success. My ball team, The FABulasses and our ladies fastball league in general also benefit from the notoriety of The F.A.B. Light. In fact, our ladies fastball team has two wishes: 1) get on ‘Ellen’ and 2) invite any and all ladies who have ever been a FABulass (over 25 years) on a cruise around the Greek Islands. The secret to balancing business and family is to get the family to join in on the business! I am consulting for other inventors who have a NEED and product idea, but don’t know the steps to taking it to market. Always looking for speaking gigs where I can share the story and expertise. I also have a few more NEEDS of my own that am considering taking to market. Right now, am consulting with North American manufacturers to build our product (and new inventions) on this side of the world (original manufacturing done in China). As I do the research, it is cheaper to build here now, due to the rising costs of energy, shipping and labour. Just do it. Sounds lame, but take the first step, and see what happens. Being an entrepreneur means you have your goal in sight, even though you may not know how to get there. Don’t get mired in ‘analysis paralysis’. Do surround yourself with those who support you and your dreams. This is such a smart idea I would love one for the toy box and also the tool box is a good idea.